A valuable resource for government officials who want to better understand how to use GIS to answer location-based questions. Redlands, California—The GIS Guide for Elected Officials from Esri Press shows how geographic information system (GIS) technology helps government officials analyze and model location-based information to make better decisions on behalf of their constituents. Can work crews respond more efficiently to service calls? Where do police and fire department calls for service originate? Are calls for service originating from the same neighborhood about the same problem, and why? The GIS Guide for Elected Officials contains dozens of case studies that cover a wide range of public issues and challenges. In addition, it provides a brief history of GIS technology and includes a review of what it takes to build and maintain a strong GIS program. "Our quality of life depends greatly on the health and sustainability of our communities," says Esri president Jack Dangermond. "We depend on our government leaders to set wise policies and plan for the smooth delivery of necessary services. The GIS Guide for Elected Officials will assist government leaders in understanding how GIS technology can aid their work and what applications are needed." 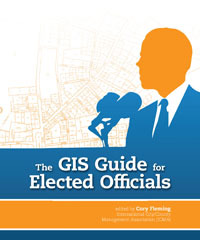 The GIS Guide for Elected Officials is available in print (ISBN: 9781589482722, 212 pages, US$19.99) at online retailers worldwide, at esri.com/esripress, or by calling 1-800-447-9778. Outside the United States, visit esri.com/esripressorders for complete ordering options, or visit esri.com/distributors to contact your local Esri distributor. Interested retailers can contact Esri Press book distributor Ingram Publisher Services.